On January 28, Washington imposed extensive sanctions on Venezuela’s state-owned oil company PDVSA, Venezuela’s largest source of national revenue. In response, Venezuelan president Nicholás Maduro called the sanctions “criminal,” vowing to retaliate. Since the death of its former president Hugo Chávez in 2013, Venezuela has been marred by instability, hyperinflation, and economic destitution. The Maduro regime has been responsible for an economic crisis that has led to a scarcity of the most basic products, including medicines and food. Waves of anti-government protests and violent crackdowns are crippling the state. However, pressure for Maduro’s resignation may be faltering. Maduro is falling back on a powerful autocratic regime structure left behind by Chávez. Chávez cultivated an army of colectivos (clandestine paramilitaries that guard the regime from its enemies) and loyal military officers. Maduro perpetuates this system and has given military officials powerful positions in government. 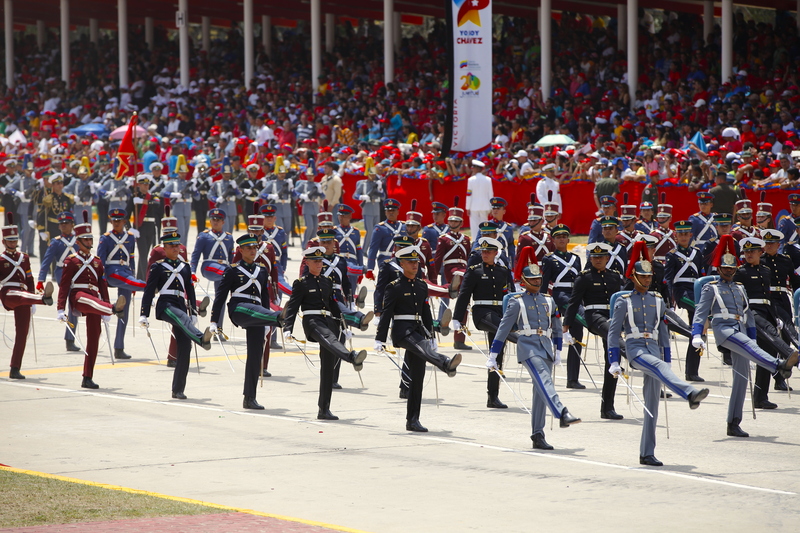 However, power and money are not what cements the military hierarchy’s support for Maduro. It is the fear of retribution. Venezuelan security forces have been accused by the United Nations of human rights abuses against their own people. A new opposition government taking power could mean hundreds of officers being put on trial for crimes against the Venezuelan people. Without a guarantee of amnesty, the military will ensure the survival of the Maduro regime in order to protect itself. Even the promise of amnesty itself may not be enough to persuade elements of the military due to the risk that it can be rescinded under a new opposition government. Several countries including Russia, Turkey, and China have expressed support for the Maduro regime further complicating the international response towards the growing crisis. Russia has even been accused of sending mercenaries to Venezuela in order to support the Maduro regime, an allegation the Kremlin has denied. Maduro’s regime is attempting to draw strong backing from the military, reminding soldiers of the history of US interventionism in Latin America. On January 28, Venezuelan defence minister Vladimir Padrino López encouraged soldiers to stand up to US imperialism, alluding to the US role role in exploiting Latin American economies with the United Fruit Company, engineering right-wing coups, as well as the arming, training, and funding of several right-wing regimes and paramilitaries that were responsible for the deaths of hundreds of thousands of Latin Americans. The Maduro regime is facing an unprecedented challenge. The most dangerous outcome lies in the military fracturing and becoming divided on whether or not to support Maduro. If mid-level and lower ranking officers, who are not part of Maduro’s corruption network, are persuaded by promises of amnesty and defect to the opposition, a civil conflict is not unthinkable. Guaidó supporters distributed leaflets describing a possible amnesty law that would protect them if they overthrew Maduro. Yet it is unlikely the Maduro regime will capitulate, for at this stage the regime and the military hierarchy are fighting for their very survival.